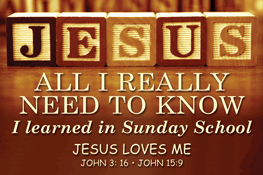 JESUS ALL I REALLY NEED TO KNOW I learned in Sunday School JESUS LOVES ME JOHN 3:16 JOHN 15: Designed for broad appeal, Messages: Friendship, Encouragement, Light-touch evangelism, Humor. Fits the core purpose of inspirational gift-giving. There is always a reason to give these cards.